Come and learn to make bricks by hand in the Easter Holidays! 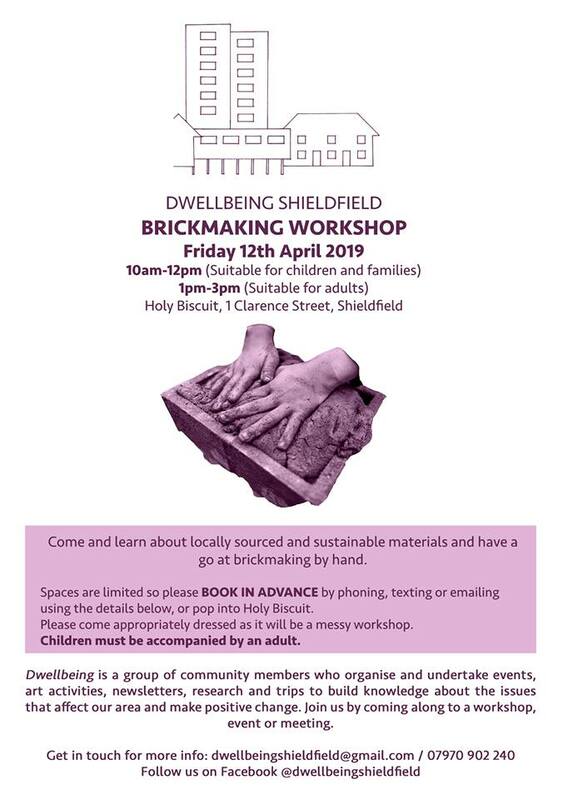 On Friday 12th April Dwellbeing will be doing two brick-making workshops at Holy Biscuit, as part of our wider scoping about building a new community space/garden called ‘Shieling’ and to be included in an exhibition at Holy Biscuit in May/June. The first workshop is for children and families and is from 10am-12pm, and the second is for adults from 1pm-3pm. Spaces are limited so please book in advance by emailing dwellbeingshieldfield@gmail.com, texting/calling us on 07970902240 or popping into Holy Biscuit. Children must be accompanied by an adult and everyone coming along should be appropriately dressed as it is a messy workshop! !